You may have visited Italy more than a few times; you may have been to Tuscany, Umbria, Sicily, The Amalfi Coast, Cinque Terre, Rome and Venice! 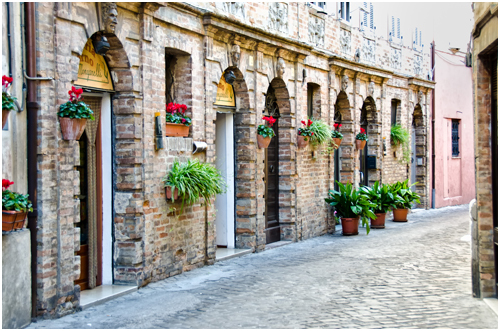 But you haven’t seen what else Italy has to offer until you have experienced le Marche. These are the numbers of le Marche, but as the locals say, that to taste the region a visitor needs only 5 things – his own senses. Tucked between the Adriatic Sea and the Apennine mountain range the region can be visited and enjoyed during all seasons. In the summer, le Marche offers some of the finest white sand beaches of the entire Mediterranean basin. A shallow sea water level makes its coastline the perfect spot for sun worshippers and beach lovers. Wintertime offers sports activities on the peaks of the Apennines, with alpine and Nordic skiing for all levels. In the fall, the hills, the region’s most prominent feature, are covered with olive trees and vineyards that produce excellent olive oil and many notable wines. Small towns, rich with history and each with its unique architectural style, offer excellent accommodations in perfectly restored farmhouses, villas, castles and monasteries. Mix everything with an exclusive local cuisine and you have found the perfect spot for your next vacation to Italy. We offer a new tour featuring some of the most beautiful little-known towns in Italy, a tour that will provide a deep inside view of real Italian life away from the crowded tourist haunts; we want you to experience le Marche as locals say: See, Hear, Smell, Taste and Touch this last highly livable place. “The Most Beautiful Small Towns of Le Marche Tour” promises to provide participants with years of wonderful memories including exclusive sights, flavors and warm hospitality. Day 2 – Ascoli Piceno/Montappone/Montefiore dell’Aso/Ripatransone/Offida/Ascoli Piceno. We constantly strive to improve tour itinerary and features. If improvement can be made, or unforeseen circumstances beyond our control make changes necessary, we reserve the right to vary itinerary excursions and to substitute hotels and restaurants.